The burger is a proprietary piece of American culinary culture: beef, bun, cheese, ketchup, good. Gussy up that utilitarian formula with frou-frou adornments and silly special sauces, and the social fabric unravels. 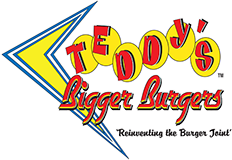 That’s what we were thinking as we slid onto a stool at Teddy’s Bigger Burgers and faced down a patty slathered in teriyaki sauce and topped with pineapple slices. Even the clown fish in the massive tank at the center of this Blue Hawaii–meets– American Graffiti burger joint braced for our “What have they done? !” screams.